The streaming radio market is not saturated yet, leaving great room for SIRI's future growth. The acquisition of Pandora creates positive synergy by expanding SIRI's portfolio of services. Investors are recommended holding SIRI. At $5.94 per share, Sirius XM (SIRI) is traded at a relatively low level. 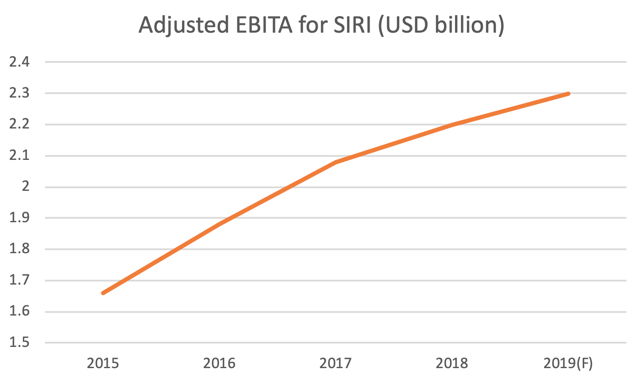 With a P/E ratio of 23.14, SIRI is delivering steadily growing profits and promising future outlook. Due to stable and strong fundamentals, SIRI is well-positioned for a price rebound and investors are recommended holding it. SIRI provides three satellite radio and online radio services in the United States. In 2008, it came close to filing for Chapter 11, but then quickly managed to avoid bankruptcy and post profits. In 2018, SIRI closed on its purchase of Pandora Media (P) for $3.5 billion. 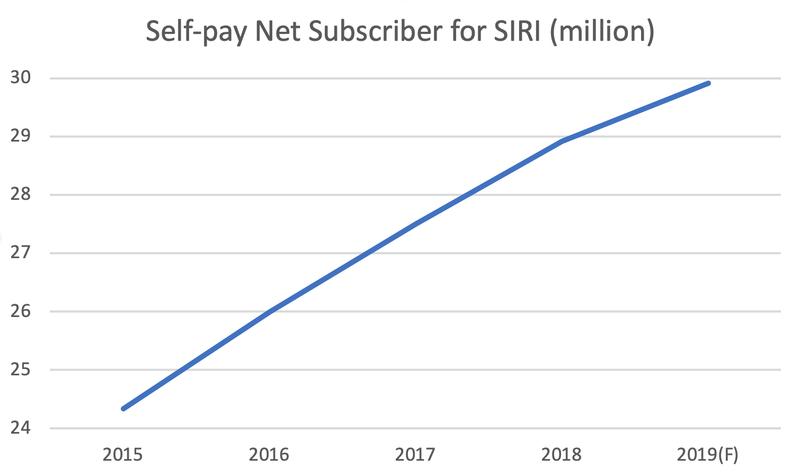 As shown in the following graphs, the growth of adjusted EBITA and self-pay subscribers for SIRI has been slowing during recent years, and management's guidance for 2019 suggests a further slowdown. 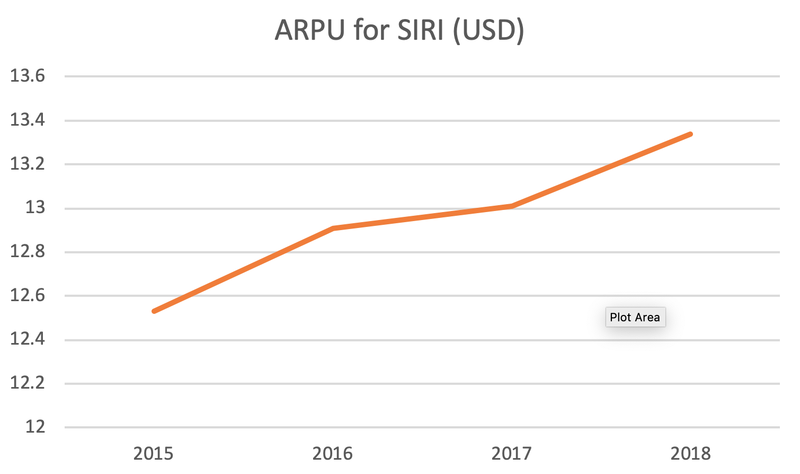 Fortunately, there is a huge jump in the average revenue per user (ARPU) for SIRI in 2018. 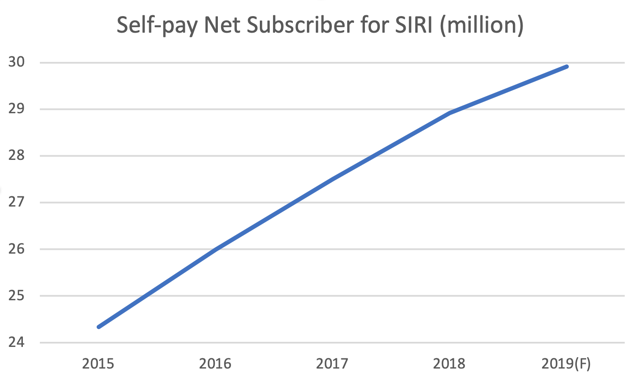 As SIRI expands its services and channels, the willingness to pay from subscribers also goes up. This creates a strong force that will drive the growth of future profits. Most of SIRI's radio services are consumed in automobiles. The company's success for the past few years is largely owed to increased automobile sales in the U.S. and strengthened partnerships with automakers and car dealers. 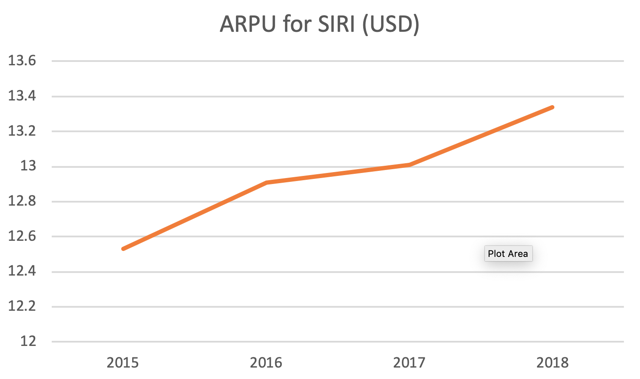 Surrounding SIRI's slowing growth, some people argue that streaming radio stations do not have enough competitiveness against terrestrial radios. Edison Research found that 70% of all US audio consumption happens in the car (versus home, work, etc. ), while 54% of this radio consumption comes from AM/FM radio. When Edison polled in 2011 if Americans used AM/FM in their primary car, 84% said yes. Edison asked again in 2018 and still got 84%. Leading streaming radio stations such as Pandora only reaches 15 percent of Americans, while Spotify (NYSE:SPOT) reaches about 5 percent. On one hand, this suggests that the terrestrial radio remains to be consumers' top choice and it is not easy for Americans to change their listening habits. On the other hand, it means the streaming radio market is far from being saturated and SIRI has huge potential for future expansion. SIRI actually has many advantages over traditional terrestrial radios. It provides commercial-free music and original formats that subscribers can't find on regular radio. It provides a more convenient, customizable way for consumers to listen to the contents they like, which may range from music and comedy to finance and sports. Streaming radio is not overhyped and this revolution will continue to strengthen in the digital landscape. 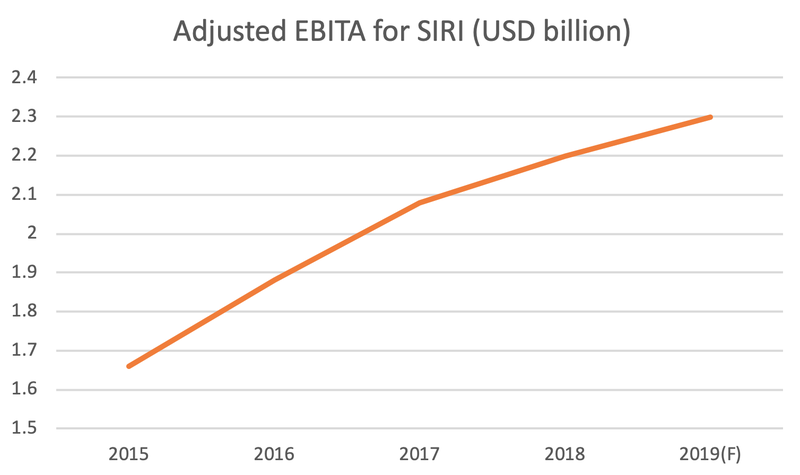 As this market continues to expand, so will SIRI's revenues. The biggest news for SIRI in 2018 is the acquisition of Pandora Media. 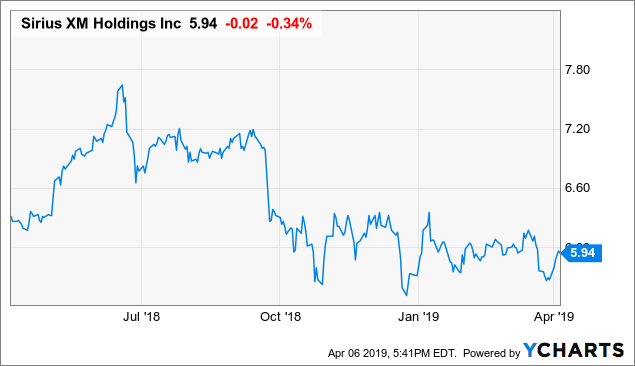 Every share of Pandora was swapped out for 1.44 shares of Sirius XM just three days after Pandora shareholders voted overwhelmingly in favor of the corporate combination. As of March 2018, the top three key vendors in the music streaming industry are Apple Music (NASDAQ:AAPL), Spotify, and Pandora Radio. 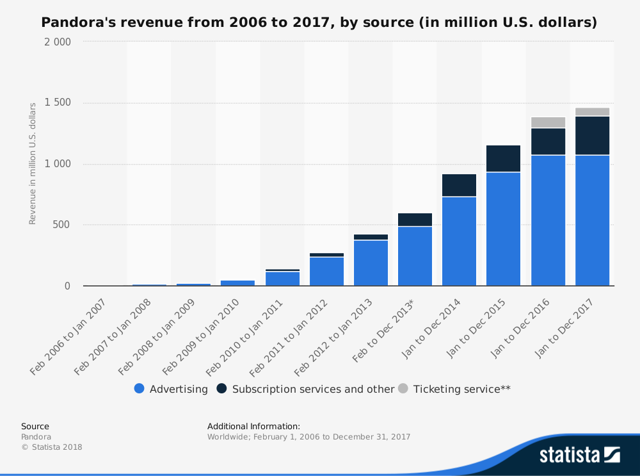 Different from its competitors, the niche market that Pandora dominates is the internet radio market in the U.S. 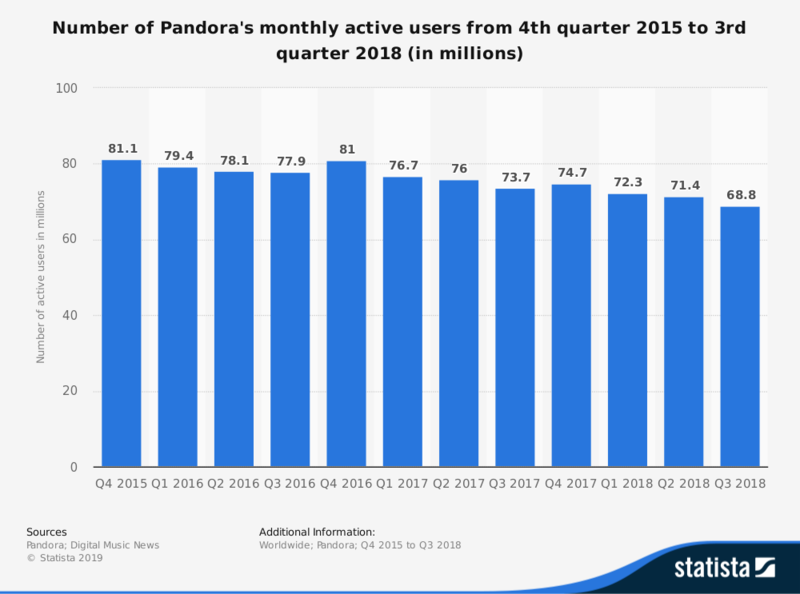 Although the number of Pandora active users has been declining since 2015, its revenues have been increasing at a slow pace. Most of its revenue growth comes from the subscription services. The ARPU for Pandora subscribers is increasing, a reflection of users' behavioral change in the music industry. Paid subscription contributes the most to the overall growth of U.S. music industry streaming revenues. Thanks to the wider user adoption for paid streaming services, the music industry saw its first-time 3-year growth in revenue ever since its peak in 1999. The higher willingness to pay that people have for streaming services is one good news for SIRI. Besides, the acquisition of Pandora greatly creates positive synergy by expanding SIRI's portfolio of services. Similar to the ecosystem built by Apple Music, Pandora and SIRI together build a complete entertainment system for car users. Consumers value all-in-one services. The more contents that SIRI provides, the higher the chance that someone will become a self-pay subscriber. What's more, the addition of Pandora Music may incentivize existing subscribers to spend more. SIRI is well-positioned for a price rebound. Despite the bearish sentiments, the streaming radio market has full potential for growth and SIRI will be the leading company to benefit from it. Besides, its acquisition of Pandora creates positive synergy, which will help boost its performance in the following years. At its current price, investors are recommended holding it.